Download "A Stateless Traceback Technique for Identifying the Origin of Attacks from a Single Packet"
1 A Stateless Traceback Technique for Identifying the Origin of Attacks from a Single Packet Marcelo D. D. Moreira, Rafael P. Laufer, Natalia C. Fernandes, and Otto Carlos M. B. Duarte Universidade Federal do Rio de Janeiro University of California at Los Angeles Rio de Janeiro, Brazil Los Angeles, USA Abstract Anonymity is one of the main motivations for conducting denial-of-service attacks. Currently, there is no mechanism to either identify the true source of an IP packet or to prove its authenticity. In this paper we propose a stateless IP traceback technique that identifies the origin network of each individual packet. We show that the proposed traceback system is the only one that scales with the number of attackers and also satisfies practical requirements, such as no state stored at routers and a header overhead (25 bits) that can be allocated in IPv4 header. The proposed system exploits the customer-provider hierarchy of the Internet at autonomous system (AS) level and introduces the idea of checkpoints, which are the two most important nodes in an AS-level path. Simulation results using a real-world topology trace show that the proposed system narrows the source of an attack packet down to less than two candidate ASes on average. In addition, considering a partial deployment scenario, we show that the proposed system is able to successfully trace more than 9% of the attacks if only 8% of the ASes (i.e., just the core ASes) implement the system. The achieved success rate is quite better than using the classical hop-by-hop path reconstruction. I. INTRODUCTION Distributed Denial-of-Service (DDoS) attacks are one of the main security challenges of the Internet today . Usually, each attacking machine generates a certain amount of traffic towards a target server and the aggregate traffic of several machines is responsible for depleting the server s resources and, consequently, making the offered service unavailable. DDoS attacks only occurs because it is possible for the attackers to hurt the victims and still remain anonymous and, consequently, unpunished . The IP layer does not provide source authentication and hence packets with spoofed source addresses can be transmitted over the network. A recent study  shows that approximately 2% of Internet Service Providers (ISPs) do not filter outgoing packets with spoofed source address. Inside such networks, a host can spoof up to 1% of all Internet addresses. Therefore, it is not possible to prove the participation of a particular machine in the attack, even if attacking machines employ real source addresses. This work aims at filling this gap in the Internet architecture in the source accountability area . A promising solution to the source identification problem is to make the network capable of tracing the attack packets back to their true source, which is known as the IP traceback problem . The basic idea of IP traceback is to reconstruct the path taken by attack packets using routers markings inserted into forwarded packets or logging information saved at routers memory . Nevertheless, up to now IP traceback has only been thought as a first step for the defense against DDoS attacks, and not as per-packet source identification mechanism. Only logging schemes and the system proposed by Laufer et al. have the ability of tracing the attacker from a single packet . These schemes, however, do not meet all the requirements that a practical solution must satisfy. To the best of our knowledge, this work is the first proposal that allows identifying the attack origin from a single packet and also fulfills practical requirements, such as no state stored at routers and a header overhead (25 bits) sufficiently small to be allocated in IPv4 header. We exploit the hierarchical structure of the Internet at AS-level to accurately locate the attacker using information from the ASes traversed by the attack packet. The novelty of our idea is to strategically choose which ASes should mark the packet. We do not store the whole attack path due to space constraints; instead, only the path information that is essential to locate the attacker is stored in the packet. 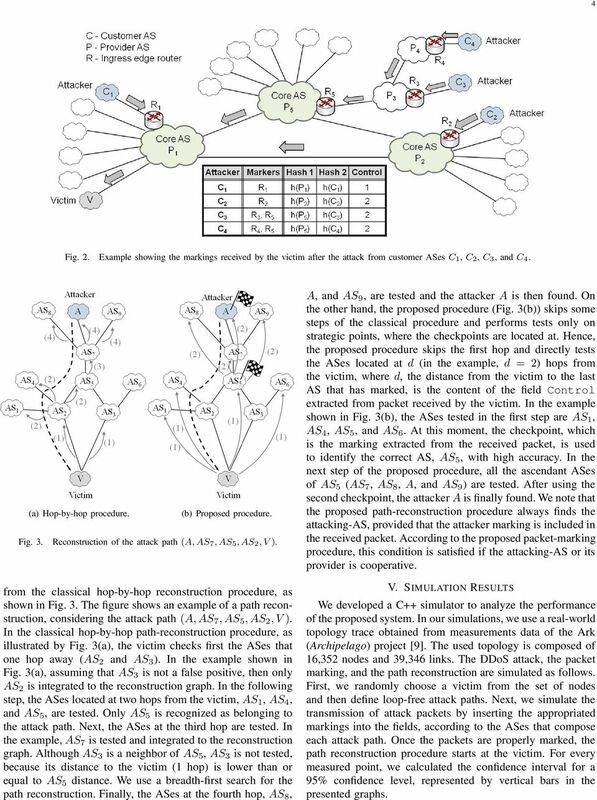 Given an AS-level attack path, we identify two ASes, called checkpoints, which are the most important for an accurate path reconstruction and propose a novel marking scheme that prioritizes these two critical nodes. This approach allows tracing the origin AS with high accuracy, despite the marking space limitation. We developed a simulator and compared the performance of the proposed system with three marking schemes  . We used the AS-level Internet topology constructed with the Archipelago (Ark) measurement infrastructure  to evaluate all traceback systems in a real-world scenario. Our key finding is that the error rate of the proposed system is independent from the number of attackers, confirming the scalability of the single-packet traceback approach. In comparison, the performance achieved by the compared systems, which rely on multiple received packets to reconstruct the attack path, quickly degrades with the number of attackers. In addition, due to the use of checkpoints, beside of being constant, the error rate of the proposed system is quite low, because we have only.8 false positives per traced attacker on average. This paper is organized as follows. Section II qualitatively compares our proposal with related work. Next, we present in Section III our findings about the AS-level path reconstruction problem that justify our solution, described in Section IV. Finally, we present simulation results in Section V and conclusions in Section VI. 3 3 given that we are at the network edge. If we move towards the network core, the number of neighbors that have to be tested increases. Likewise, if we keep increasing the distance, we reach the edge of the network again and, therefore, the number of neighbor ASes decreases. This behavior reflects the customer-provider AS-level hierarchy. The customer-provider relationship is a consequence of commercial relations between ASes: a customer AS pays its provider AS to transport traffic from/to the customer AS. Commonly, a provider AS has lots of customer ASes, forming what is known as the customerprovider hierarchy. This hierarchy is also seen in the AS-level paths characteristic: 62% of paths are only 3 hops long . In the most common path pattern, a packet is originated in a customer AS, goes up to two core ASes and then it goes down to the customer AS of the destination. According to Fig. 1, the critical steps during path reconstruction occur at second and third hops, where one must test on the worst case 898 and 149 upstream ASes, respectively. We have a large number of ASes due to the concentration of paths that pass through the large providers, called core-ases. Half of the Internet paths traverse the 1 ASes with more than 5 neighbors . Departing from the victim towards the attacker AS, the path reconstruction procedure can easily find the victim s provider and enter the network core. Nevertheless, to go away from the network core requires testing almost one thousand ASes, which may result in a high false-positive rate. Thus, the first critical step in the path reconstruction is the identification of the first core AS of the attack path. The second critical step occurs when the reconstruction procedure reaches the attacker s provider and is trying to locate the attacker AS. In this step, the attacker AS must be identified among about one thousand ASes. IV. THE PROPOSED SYSTEM As Castelucio et al. , we propose to use the Border Gateway Protocol (BGP) as a vehicle to distribute the deployment information. Cooperative ASes, i.e., the systemdeployed ASes, advertise their support for traceback in a BGP attribute in route advertisements. Hence, an overlay network is formed by cooperative ASes, allowing a given AS to determine whether it is the first cooperative AS of a given path or not. 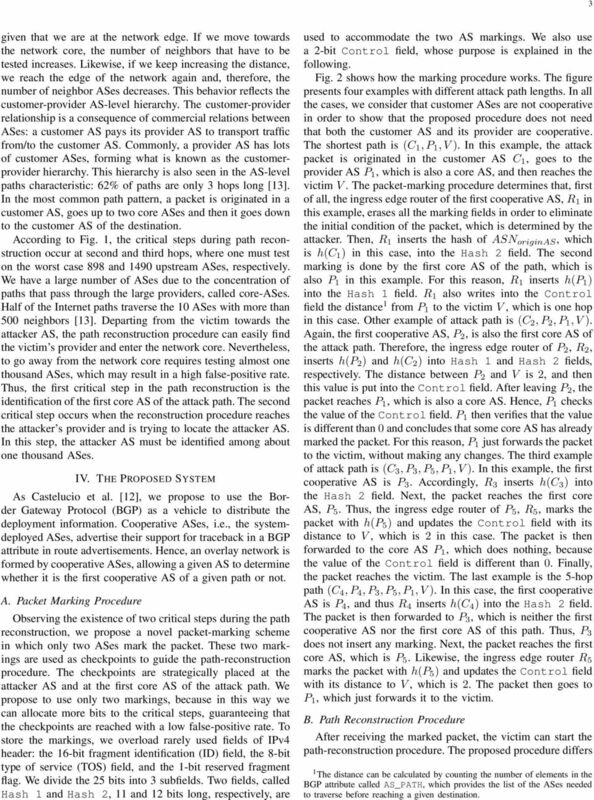 A. Packet Marking Procedure Observing the existence of two critical steps during the path reconstruction, we propose a novel packet-marking scheme in which only two ASes mark the packet. These two markings are used as checkpoints to guide the path-reconstruction procedure. The checkpoints are strategically placed at the attacker AS and at the first core AS of the attack path. 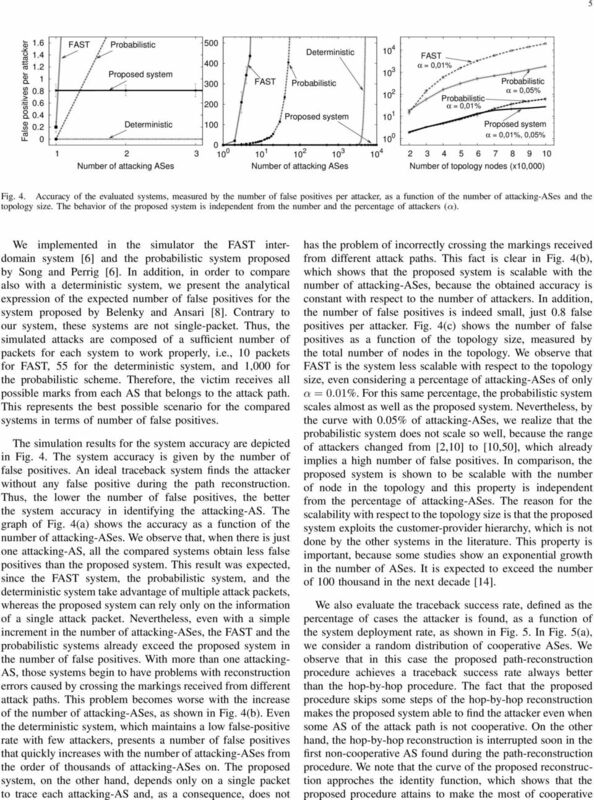 We propose to use only two markings, because in this way we can allocate more bits to the critical steps, guaranteeing that the checkpoints are reached with a low false-positive rate. To store the markings, we overload rarely used fields of IPv4 header: the 16-bit fragment identification (ID) field, the 8-bit type of service (TOS) field, and the 1-bit reserved fragment flag. We divide the 25 bits into 3 subfields. Two fields, called Hash 1 and Hash 2, 11 and 12 bits long, respectively, are used to accommodate the two AS markings. We also use a 2-bit Control field, whose purpose is explained in the following. Fig. 2 shows how the marking procedure works. The figure presents four examples with different attack path lengths. In all the cases, we consider that customer ASes are not cooperative in order to show that the proposed procedure does not need that both the customer AS and its provider are cooperative. The shortest path is (C 1, P 1, V ). In this example, the attack packet is originated in the customer AS C 1, goes to the provider AS P 1, which is also a core AS, and then reaches the victim V. The packet-marking procedure determines that, first of all, the ingress edge router of the first cooperative AS, R 1 in this example, erases all the marking fields in order to eliminate the initial condition of the packet, which is determined by the attacker. Then, R 1 inserts the hash of ASN originas, which is h(c 1 ) in this case, into the Hash 2 field. The second marking is done by the first core AS of the path, which is also P 1 in this example. For this reason, R 1 inserts h(p 1 ) into the Hash 1 field. R 1 also writes into the Control field the distance 1 from P 1 to the victim V, which is one hop in this case. Other example of attack path is (C 2, P 2, P 1, V ). Again, the first cooperative AS, P 2, is also the first core AS of the attack path. Therefore, the ingress edge router of P 2, R 2, inserts h(p 2 ) and h(c 2 ) into Hash 1 and Hash 2 fields, respectively. The distance between P 2 and V is 2, and then this value is put into thecontrol field. After leaving P 2, the packet reaches P 1, which is also a core AS. Hence, P 1 checks the value of thecontrol field. P 1 then verifies that the value is different than and concludes that some core AS has already marked the packet. For this reason, P 1 just forwards the packet to the victim, without making any changes. The third example of attack path is (C 3, P 3, P 5, P 1, V ). In this example, the first cooperative AS is P 3. Accordingly, R 3 inserts h(c 3 ) into the Hash 2 field. Next, the packet reaches the first core AS, P 5. Thus, the ingress edge router of P 5, R 5, marks the packet with h(p 5 ) and updates the Control field with its distance to V, which is 2 in this case. The packet is then forwarded to the core AS P 1, which does nothing, because the value of the Control field is different than. Finally, the packet reaches the victim. The last example is the 5-hop path (C 4, P 4, P 3, P 5, P 1, V ). In this case, the first cooperative AS is P 4, and thus R 4 inserts h(c 4 ) into the Hash 2 field. The packet is then forwarded to P 3, which is neither the first cooperative AS nor the first core AS of this path. Thus, P 3 does not insert any marking. Next, the packet reaches the first core AS, which is P 5. Likewise, the ingress edge router R 5 marks the packet with h(p 5 ) and updates the Control field with its distance to V, which is 2. The packet then goes to P 1, which just forwards it to the victim. B. Path Reconstruction Procedure After receiving the marked packet, the victim can start the path-reconstruction procedure. The proposed procedure differs 1 The distance can be calculated by counting the number of elements in the BGP attribute called AS_PATH, which provides the list of the ASes needed to traverse before reaching a given destination. 4 4 Fig. 2. Example showing the markings received by the victim after the attack from customer ASes C 1, C 2, C 3, and C 4. (a) Hop-by-hop procedure. (b) Proposed procedure. Fig. 3. Reconstruction of the attack path (A, AS 7, AS 5, AS 2, V ). from the classical hop-by-hop reconstruction procedure, as shown in Fig. 3. The figure shows an example of a path reconstruction, considering the attack path (A, AS 7, AS 5, AS 2, V ). In the classical hop-by-hop path-reconstruction procedure, as illustrated by Fig. 3(a), the victim checks first the ASes that one hop away (AS 2 and AS 3 ). In the example shown in Fig. 3(a), assuming that AS 3 is not a false positive, then only AS 2 is integrated to the reconstruction graph. In the following step, the ASes located at two hops from the victim, AS 1, AS 4, and AS 5, are tested. Only AS 5 is recognized as belonging to the attack path. Next, the ASes at the third hop are tested. In the example, AS 7 is tested and integrated to the reconstruction graph. Although AS 3 is a neighbor of AS 5, AS 3 is not tested, because its distance to the victim (1 hop) is lower than or equal to AS 5 distance. We use a breadth-first search for the path reconstruction. Finally, the ASes at the fourth hop, AS 8, A, and AS 9, are tested and the attacker A is then found. On the other hand, the proposed procedure (Fig. 3(b)) skips some steps of the classical procedure and performs tests only on strategic points, where the checkpoints are located at. Hence, the proposed procedure skips the first hop and directly tests the ASes located at d (in the example, d = 2) hops from the victim, where d, the distance from the victim to the last AS that has marked, is the content of the field Control extracted from packet received by the victim. In the example shown in Fig. 3(b), the ASes tested in the first step are AS 1, AS 4, AS 5, and AS 6. At this moment, the checkpoint, which is the marking extracted from the received packet, is used to identify the correct AS, AS 5, with high accuracy. In the next step of the proposed procedure, all the ascendant ASes of AS 5 (AS 7, AS 8, A, and AS 9 ) are tested. After using the second checkpoint, the attacker A is finally found. We note that the proposed path-reconstruction procedure always finds the attacking-as, provided that the attacker marking is included in the received packet. According to the proposed packet-marking procedure, this condition is satisfied if the attacking-as or its provider is cooperative. V. SIMULATION RESULTS We developed a C++ simulator to analyze the performance of the proposed system. In our simulations, we use a real-world topology trace obtained from measurements data of the Ark (Archipelago) project . The used topology is composed of 16,352 nodes and 39,346 links. The DDoS attack, the packet marking, and the path reconstruction are simulated as follows. First, we randomly choose a victim from the set of nodes and then define loop-free attack paths. Next, we simulate the transmission of attack packets by inserting the appropriated markings into the fields, according to the ASes that compose each attack path. Once the packets are properly marked, the path reconstruction procedure starts at the victim. For every measured point, we calculated the confidence interval for a 95% confidence level, represented by vertical bars in the presented graphs.